It’s Earth Day, Bobcats! Reducing your waste on a day-to-day basis can seem like a difficult task to adjust to, but have you ever thought about how easy it really is? Here are some tips to help you reduce your waste output on the Earth. Unplug: Take a look around your bedroom. Are you taking up wall outlets all day? Try unplugging electronic devices when you leave, like your toaster, chargers and anything in between. You’ll reduce your electricity bill and help reduce your consumption! Use PDF’s: Depending on your major, you may find yourself printing out documents more than the average student. Instead of printing out hundreds of pages throughout the semester, try switching to PDF formatted documents and use them to take notes on your electronic devices. Not only can you edit notes, but if you need to share documents with multiple people, you’ll also reduce the amount of paper you need to print for them! Work remotely: Getting groups together to work on a project can be a hassle because of conflicting schedules, living in different cities and so on. Tools like Zoom Pro and Office 365 make it easy to get your group members together no matter where you are. Use Zoom Pro to have face-to-face meetings and then move over to Office 365 tools like Word, Excel, or PowerPoint for simultaneous collaboration. These are just small steps to help make the Earth a little greener, but they can make a big impact if more and more people follow them. Go out and get a break from your tech! 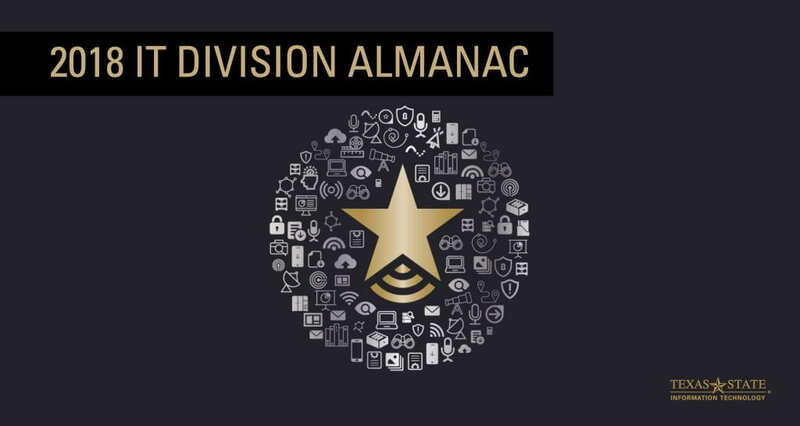 The 2017-2018 edition of our Division of Information Technology Almanac is online! The Almanac is packed with stories about the work the division does to make Texas State University great, such as the our website rodeos that helped make better websites across Texas State, opening of the new IT Assistance Center help desk at the Round Rock Campus, and creation of the new Texas Music pillar at The Wittliff Collections. The people in our division work extremely hard to provide the university community with effective, reliable, and secure technology and library services, and we wanted to share these successes with you. Read the new Almanac today! 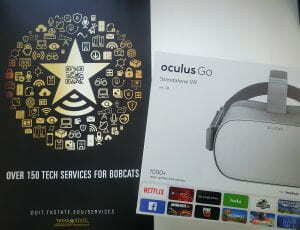 As part of the promotion of Innovation Week and Alkek Technology Day, the Division of Information Technology will be giving away one 64GB Oculus Go VR headset to a student at Texas State University. All students, except those employed by the Division of I.T. are eligible to enter, assuming the requirements for a valid entry are met. Must enter no later than 5 PM, Thursday, September 27, 2018. The winner of the giveaway will be selected by a random drawing which will be completed electronically. Winner will be notified by an announcement on the DoIT social media Twitter, Facebook, and Instagram channels on Monday, October 1. This announcement will specifically mention the username associated with the winning account and it is the responsibility of the winner to contact DoIT within 48 hours to claim their prize or a new winner will be chosen. Winners will be required to accept their prize in person and take a photo with the DoIT team to be used on the Division’s social media channels. 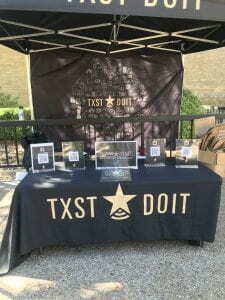 Bobcats who stopped by our tent on the quad during the first week of school got some great DOIT gear and learned about the many tech services available. They also noticed that all of our signs had QR codes. 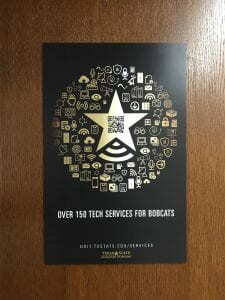 If you’re like many of the Bobcats we talked to, you may not know about QR codes or how easy it is to use them. Quick Response codes, AKA QR codes, are a great way of directly linking to information on people, places, events, and more on the internet. In fact, with recent iOS and Android updates (on some models), you simply point at them and click the link that automatically pops up on your phone. 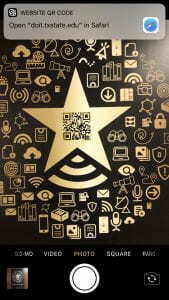 There’s even a QR code in the DOIT Tech Star on the posters we have put up around campus. Here are the steps to scan a QR code on an iPhone. Once the link appears, tap it and you’re done! Just three steps, and in less than one minute, you are accessing information! Keep an eye out for more posters and other media with our QR codes around campus this semester. Want more tips and tricks? Let us know what you’d like to see. You can find us on Twitter @TXST_DOIT. Comments on the contents of this site should be directed to Angela Smith, Luis Seijo, Steffanie Agnew, or Scott Ayers.